Sid (Fisher) Motor Co. Inc.
Southside Gas & Electric Co.
Springfield Fire & Marine Ins. Co.
Standard Oil Company of Cal. 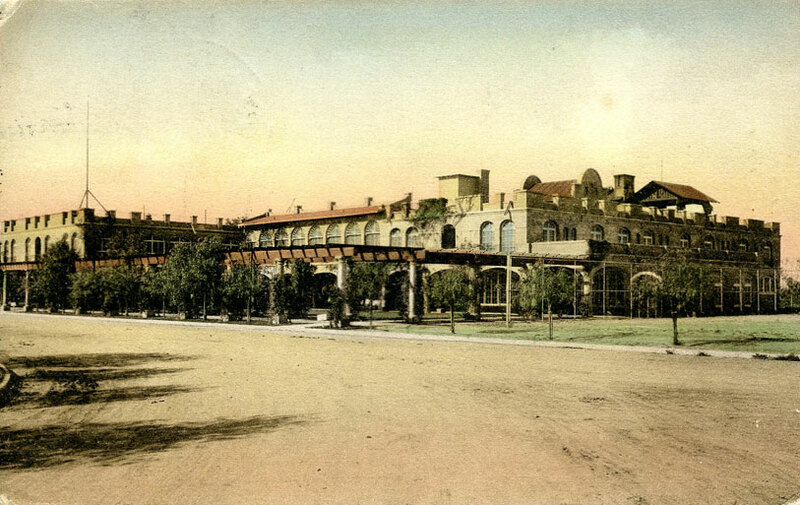 The 1921 Chandler (Arizona) City directory said H. P. Smith was general manager and the San Marcos Hotel Co., the proprietor, or owner. The hotel was at the corner of San Marcos Place and Buffalo. The 1923 directory identified owners as the San Marcos Hotel Co., of which A. J. Chandler was president, and E. J. Koch, secretary proprietor. The 1925 and 1926 directories said Mrs. G. P. Robinson (Grace) was manager. A. J. Chandler was president and E. K. Hoak, vice president. 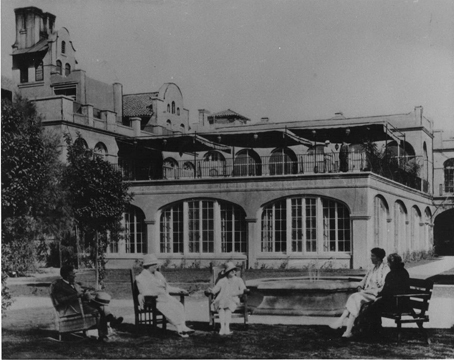 E. J. Koch was secretary of the hotel or the San Marcos Hotel Co. The 1929, 1930, 1931 and 1932 directories said Mrs. G. P. Robinson was manager of the hotel, which was at 25 San Marcos Place. Tel 49. The 1929 directory also listed A. J. Chandler as president of the San Marcos Hotel Co. and J. E. DeSouza as secretary-treasurer. Its address was 2 San Marcos Place, Tel 16 or 25. The 1930 directory just said A. J. Chandler was president of the San Marcos Hotel Co. The hotel also appears in the 1932 Phoenix Telephone Directory, Chandler section, with the phone number 49. The 1940 Chandler Resident Directory said Robert Foehl was president and manager and that the hotel had the number 49. The directory also showed that most employees, such as kitchen helpers, lived there and had the same phone number. -Work on the hotel is being pushed as rapidly as it is possible for money and men to do. Weaver Construction Company of Los Angeles is doing the construction, and WR Hoag is the superintendent. Frank Newman is in charge of the plumbing crew, and J.M. Stine is a machinist and engineer. Joe Cashman works in management. 20 cars of material arrived in the last week. It is given that within 75 days after the first concrete is poured the hotel will be ready for occupancy. -Within the next ten days, the structure will be under cover, and then the work of interior finishing can be pushed forward more rapidly as the more expensive parts will have protection from the weather, in case of rain. Completion of the hotel will forward business in Chandler since only one or two of the ground floor stores are rented. The Kohn system of metal and plaster partitions in the last week have been started and continue to be installed. This is the finest system known in the country. It will be fireproof with metal laths and steel studs in the interior walls. The work of putting the finished cement floors is underway, and a considerable amount of the lower building is done. The finished brick is also being laid in the lobby. The magnificent fireplace, is one of the prettiest and most unique of the west. S.S. Bradley is chief electrician, and says the work of installing the lighting system is underway. Fireproof conduits and the wiring throughout are of the finest, and is said to have no equal in the state of Arizona. The lighting system is approved by the insurance underwriters as the best available. The switchboard will be marble with flush push switches, while the chandeliers are being especially made for the hotel. Electric devices in each guest room will be of the finest with every possible convenience. There will be a telephone in every room. A two light chandelier will be placed above the dresser, near the bed will be a table for the telephone, while a droplight will be placed next to it. Each room will have a writing desk, which will carry a sunken light. All lights will be operated by a switch near the bed. -On Monday, the steel lathing was put in place, and as fast as the iron will go up the plasterers will come and cement them. The cement floors for both landings are still being laid, while wiring is going as speedily as possible. -Work is progressing rapidly on the interior; the inside walls are being plastered while the partitions are being placed on the upper floors. The electric wiring is going forward as fast as possible, while the great bulk of hte steel interior is in place. Superintendent Jennings has begun the erection of the columns around the outside of the building. The holes are being dug for the bases and the uprights placed. The columns will be solid concrete, and will nearly surround the building in the form of an outer court. Within the next two weeks a definite idea of how the interior and exterior will look can be gained. -Twelve columns of concrete each one weighing over a ton have been placed. These will form a pergola aroundt he south and east portions of the hotel. The south side was done early and east side is almost finished. Supt. Jennings stated Monday that the store room would be finished first. The partitions are being placed, and the steel lathings being nearly in. As soon as the pergola is completed vines will be grown and trained over the top which will give it a coding effect. The interior material finish is on the way from Los Angeles. This includes the doors, windows, casings, frames, and counter for the lobby, and other fixtures. -Last Friday was the first dance at the San Marcos Hotel, and it was in the ballroom. The room was decorated with building tools like wheelbarrows, brooms, shovels, picks, plasterers and carpenter's implements, a sack of cement, hoes, etc which adorned the walls. The piano was decorated with an American flag. There was cornmeal on the floor. The dance was under the direction of Supt. Jennings, and the piano was played by Bert Rinear with two men from Mesa. Electric lights shined around the room, and punch was served with touch of claret. It was served in a cut glass washtub with tin cups. The dance lasted until 12:30. -The plaster on the exterior north wing has been finished, and gives an idea what the building will look like. The scaffolding has been torn down from the southwest corner of the structure since it is finished. -Mill product has arrived for the San Marcos Hotel on Tuesday. A crew of carpenters were at once put to work to complete the interior. The wood work on the stores will be done first, and then the north wing. -The hotel will contain 1300 to 1500 incadescents. S.S. Bradley, cheif electrician, says that it required three miles of copper stands to wire the hotel, and two and one-half miles of iron pipe to incase the wires. This does not include the inside wiring. There are 130 circuits for the building. All the circuits are carried into the basement where a heavy switchboard of Vermont marble, seven feet high and six feet wide, takes the cables and forms the base of operation for the lighting of the hotel. Circuits lead to the lobby, north, south, and center wings, and the south basement and public toilet. There are 13 cabinet boxes mounted on a marble panel, containing switches and fuses that are to be erected in the lobby, dining room, and stores. The outside wires will come in underground so there will be no poles of wire exposed. A vaccuum cleaner of huge porportions will be installed to be run by electricity. There will be an electrical garbage burner in the basement. A motor will be installed to keep the oil pump cool. In the kitchen, as many appliances as possible will be run by electricity. The meat chopper and coffee grinders will be run by a motor. There will be electrical dishwashers, stoves, and plate warmers. Anything that can be run by power will be. The "juice" will come from the Roosevelt Dam. -Over 150 people came to the dance at the San Marcos Hotel last Saturday night. Many guests came from Phoenix, Tempe, and Mesa. The dancing lasted to a late hour. The crowd was dense, and at times made it hard to dance. Every second or third dance would be a "rag" which prevented some from dancing. Claret punch was served. Dr. Chandler made an appearance at the dance earlier in the evening. -8,000 pounds of plate glass for the hotel has arrived last week, and is being rapidly installed. All the windows in the store rooms have been placed, while the cement exterior walkways have been laid. Superintendent Cashman is rushing the work, and expects to be done by the end of summer. Work on the new offices is being done rapidly for the Chandler Improvement Company inside the hotel. -Mrs. Chandler and William Loftus have been busy designing the interior of the hotel, and went to the coast for a few weeks getting the furnisihings. It will cost about $50,000 to decorate, and should be shipped to Chandler by August 15th. It should be done and installed by October 15th. The lobby windows will be draped in French cretons, while the furniture will be fumed finished rottan with Spanish leather upholstering. The gentleman's writing room will be like the lobby. Portable incadescent lamps with fumed wicker will match the balance of the furniture. The arcade which runs the length of the hotel will be equipped with malachite finish furniture with big roomy rockers and chairs. The plaza east of the arcade will contain a fountain in the center, and will be laid out with walks and gardens. The dinning rooms will have grey French creton draperies, while the furniture will be black and white rattan. The china and glassware will be the finest available, and especially designed for the hotel and it's characteristics. The assembly room on the second floor will be painted a soft yellow with draperies of old tapestries, and floors will be covered with red rugs. The furniture will be of Elizabethian period with chairs and rockers containing can seats and backs. The finish will be Circassian walnut. The portable lamps will be finished to match the furniture, and lined with a soft yellow silk to match the walls. The ladies' restroom on the first floor will be in white enamel with French creton draperies. The furniture will be a natural finish rattan. The finest two-tone rugs will cover the floors. The ladies' reading room on the second floor will be painted in a soft brown with two-tone rugs. French creton draperies will match the brown. The furniture will be black and with cushions matching the walls and draperies. The lamps will harmonize with the color schemes. The bedrooms will have different color schemes. French creton draperies will be on all windows, and the walls will be a soft green. The dressers and chiffoniers will be divided equally between the Circassian walnut and bird's eye maple. The beds will be square effects with brass with panels of wood on each end of the bed. The wood would match the chiffoniers and dressers. The desks, tables, chairs, and rockers will be natural finish rattan. One unique feature of the bedrooms is the dressers and chiffoniers will be glass topped, and under them will be creton to match the draperies. The silver service was bought from Reed and Barton in Tauton, Massachusetts, and it is the finest that can be bought. It is equal to the Alexandria in Los Angeles. The chinaware is imported Germanware, and was designed especially for the hotel, and the glassware is the same. The kitchen equipment and refrigerating system is top of the line. The linens, towels, bedding, blankets, etc. are the finest available. The mattresses are the most modern design with the Marshall ventilation. Each one has loose springs, and hair on top and bottom. When weight is put on it, the old air goes out and the new air comes in. The pillows are live geese feathers and pure white. All the bedroom floors will be covered with Kazak Scotch rugs. The upper porch will have chairs, rockers, and tables with a natural finish rattan. A number of swings for children and grown-ups will also be available. The roof garden will have old hickory furniture with grass rugs with plenty of comfortable chairs and rockers. Vines, plants, and other shrubbery will give a harmonious blend. -The block just west of the hotel is being fitted up by Supt. Cashman, and will be an annex to the hotel. It will provide over fifty rooms, fully equipped with running water and baths. Bob Plenty's dining room is being changed to fit 48 people seating capacity. It has been taxed to capacity. Last Sunday, it was impossible to accomadate everyone. Many had to wait for an open table. The dining room will be placed next to the old offices of the Chandler Improvement Company. The old offices of the Chandler Improvement Company are being divided into six rooms. The lodging house will be here. The bunk houses used by the employees will be remodeled and converted into rooms. -A smoldering blaze last Thursday from the wind storm nearly resulted in a lot of damage to the hotel. The wind whipped the embers around the buildings, and started smaller fires in one or two places. Browse ChandlerpediA/People/People A-Z/A/Anderson, W. H.
Browse ChandlerpediA/People/People A-Z/H/Hall, David W.
Browse ChandlerpediA/People/People A-Z/P/Park, Frank E.
Browse ChandlerpediA/People/People A-Z/H/Hilton, George C.
Browse ChandlerpediA/People/People A-Z/M/Meason, Anna F.
Browse ChandlerpediA/People/People A-Z/G/Godding, Milon O.
Browse ChandlerpediA/People/People A-Z/T/Thiene, Paul G.
Browse ChandlerpediA/People/People A-Z/C/Chisholm, William A.
Browse ChandlerpediA/People/People A-Z/H/Hoag, Walter R.
Browse ChandlerpediA/People/People A-Z/L/Loftus, William M.
Browse ChandlerpediA/People/People A-Z/B/Bassett, Mary Mrs.
Browse ChandlerpediA/People/People A-Z/E/Easton, Henry (Harry) W.
Browse ChandlerpediA/People/People A-Z/H/Hoak, E. K.
Browse ChandlerpediA/People/People A-Z/J/Johnson, Matthew P.
Browse ChandlerpediA/People/People A-Z/R/Riordan, D. E.
Browse ChandlerpediA/People/People A-Z/G/Green, Edna E. Mrs.
Browse ChandlerpediA/People/People A-Z/B/Black, E. V.
Browse ChandlerpediA/People/People A-Z/B/Brooks, Laura S. Mrs.
Browse ChandlerpediA/People/People A-Z/C/Calley (Callie), Ella M.
Browse ChandlerpediA/People/People A-Z/C/Cooper, F. W.
Browse ChandlerpediA/People/People A-Z/L/Lorenz, Mary P. Mrs.
Browse ChandlerpediA/People/People A-Z/M/Mooner, M. R.
Browse ChandlerpediA/People/People A-Z/S/Salsman, A. H.
Browse ChandlerpediA/People/People A-Z/S/Schildman, John A.
Browse ChandlerpediA/People/People A-Z/D/Daniels, John W.
Browse ChandlerpediA/People/People A-Z/C/Chung, P. H.
Browse ChandlerpediA/People/People A-Z/C/Cowley, Raymond N.
Browse ChandlerpediA/People/People A-Z/P/Pritchard, Etta Mrs.
Browse ChandlerpediA/People/People A-Z/R/Reese, Veleda Mrs.
Browse ChandlerpediA/People/People A-Z/V/Valenzuela, Jose F.